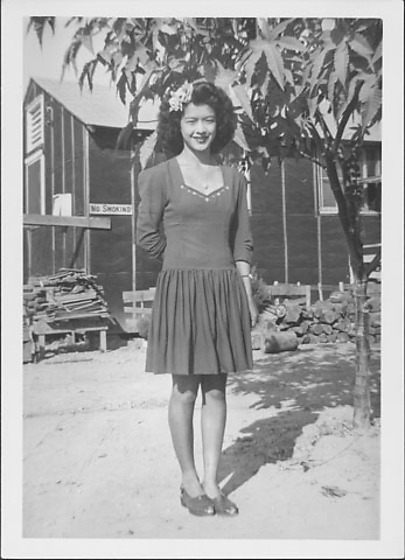 Full-length portrait of a smiling young woman in short dress with embroidered sweetheart neckline, sandals, and flower in her hair standing by small tree at Rohwer concentration camp, Rohwer, Arkansas, October 16, 1944. She also wears small wristwatch and a heart-shaped pendant; flower is on proper R. Small tree at R. Pile of scrap lumber stacked by "No Smoking" sign on barracks in background L; and pile of firewood along barracks. Stamped in black ink on back: C: OCT 16 1944.